For a little while now I have been struggling with Bailey's bedtime routine. I have been trying to read up on sleeping and the best ways to put her down. There are soo many different ways, holding her, just sticking her in her crib, letting her cry it out, not cry it out and many others. With all these different methods and theories it can become confusing to make a good choice, but I am coming to the realization that I need to do what I feel is right for her. This has mostly been brought on by her going to sleep in her own room. I cherish the time that Bailey and I spend at night. During this time she nurses and wants my undivided attention (any other time of the day she just looks around), but at night she wants to just smile at me, stare at me, and she wants me to talk to her and stare at her. She does not want Tony nor Roxy in the room with us, she actually will do her yell cry until they leave, it is really pretty funny. We thought it was a coincidence, but Tony and I have tested this several times!! She then ends up falling sleepy. She then wants her binky. As I rock her to sleep, I always play with her hair, rubbing her head and I sing to her. Every night since Bailey has been a baby I have sang the same song (see below lyrics and link to song "Lullaby" by the Dixie Chicks) to her as she is going to bed. I absolutely love the lyrics to this song and thought it was perfect. It says everything I would like to say to her. I do not have the best voice, but she always is really calm and content as I sing. I love listening to her breath and the feeling of holding her as she snuggles and falls heavy into my arms. Most nights I will rock her and just close my eyes at the end enjoying every second of this moment. This moment that I am thankful to have and that I know I will not have forever. I think as a mom, there is nothing more precious as your baby falling asleep in your arms. And this was my answer... it may take me 30 minutes or more to put Bailey to sleep, I may have less time to myself, things may get left undone, and yeah maybe I will not have a set routine, and I may come across issues here or there, but I would not trade the moments in this 30+ minutes for anything. I love you my sweet Bailey. On this Marvelous Monday I am going to share something near to my heart. I have not talked about Bailey's Birth Story as of yet (so a lot of the story and details will be left out), so I will leave that for a different blogging time as I am not quite ready. Tony and I prepared for my whole pregnancy for Bailey's birth, we talked endlessly about our desires, and especially how we wanted Bailey to come into this world. I was open to many other options regarding pain medication although I did not want to have a c-section. 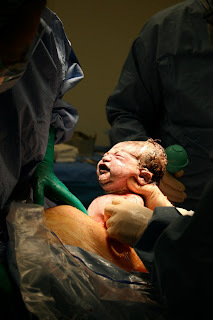 To me at the time, a c-section is an unnatural way to bring a baby into the world, plus, it is a major surgery. Tony and I attended Bradley Birthing class and were prepared to have our baby using these methods. I was more than excited to experience birthing our baby, and imagined the scenario in my head many times, and dreamed of holding my baby right after she came out. I, being a plan oriented person had a birth plan (although I knew we would not follow everything about it) and I knew that I wanted Tony and My Mom there with me, this was the most important fact. Both those people know me, know my limits, my wants, how to comfort me, and support me. When I went into labor with Bailey, things got difficult, her heart rate went very high, I was running a fever, she was sunny side up, and well we got to 7 centimeters dilated and then waited there for 4 hours with no change. My doctor was awesome, he knew my wishes and let me stay at 7 centimeters for longer than usual, he did this so that I would know that he gave my body a chance to progress and did not cut me short. 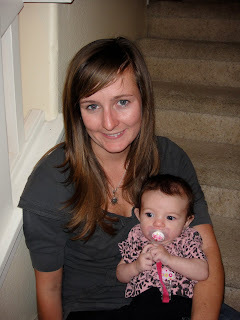 I was in extreme pain, having excruciating back labor... They monitored Bailey, but her heart rate would not go down, that is when they put me in for an emergency cesarean section. When they told me my heart sank... my dreams fell. I felt like a complete failure. I felt like something was being taken away from me that I wanted so bad! At this point all I could think about was Bailey, and making sure she was okay. As they wheeled me in for my c-section I was very tired. I had been in labor for 20-25 hours at this point. Once I got into the operating room, I felt an overwhelming tired feeling. I could barely keep my eyes open. My body just started to shut down at this point. I remember certain things. Seeing my Mom and Tony there, them holding my hand, when Bailey came out I remember everyone saying things like: "Wow, she is a big baby", "She has a beautiful head of hair", and that she was "Covered with body butter". I remember just listening for her to cry and her loud cries throughout the room; I remember looking over and seeing them clean her up and glancing at her as the nurses were doing their jobs, but after that I remember nothing (until later when they wheeled me into the NICU to see her, I will never forget that). That is the part that kills me inside, the nothing part. Tony said I just could not stay awake and they tried to wake me up. Till this month that was the thing I could not handle. I missed out on my baby's birth. For the weeks after her birth I looked through the photos my Mom had taken (I am SOO very thankful for all those photos, even the ones from the NICU, that are harder for me to see), hoping to remember something, hoping I could go back. I could not even handle looking at them and would break down crying every time. People told me after Bailey's birth that at least she was healthy (as this statement is true) at the time this is the last thing I wanted to hear. I could not even talk about her birth without crying. I could not even handle looking at my scar, the reminder of what happened that day and how Bailey had to come into the world. This was my perspective, and I have not stopped thinking about this since Bailey was born. through thinking about this whole situation I have come to find peace with it. Peace with having to have an operation to bring Bailey into this world, Peace that I did not get to have the experience of having Bailey naturally, and Peace with this 8 inch scar. I realized that Bailey is the end product and that is one of happiness. 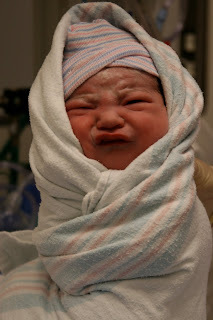 That however she entered this world, it is her Birth Story. That is is beautiful, because I carried her for 40 weeks, and she is here and healthy. I am fortunate that my husband wrote all about her whole birth story day by day, which I treasure and have read many times. In the days after we returned home he sat down with me and told me about every photo in detail, so now I share many of his memories. Now, I still do deep in my heart wish that this was not the way it needed to be. I have realized that everything happens for a reason in life, I might have not figured out the reason. I had to be strong in ways I did not think I could be. 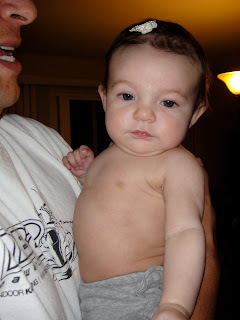 I had never been through surgery, I had 2 epidurals, and 20-25 hours of labor. My scar has become my reminder that Bailey is here with me and always will be. Bailey's birth story might not be how I pictured it, but she is more than I could ever have imagined. She is what made everything about this situation good. She has taught me how to be a mommy. In this journey I have realized that I am very lucky to have Bailey here, no matter how she came. Some people do not get the opportunity to have children, some people have lost their children, some children have cancer and so many other heartbreaking situations, ones that we can not control, that are out of our power. Trying to trust that out of every situation, beauty arises. On this Marvelous Monday, I am thankful for how my baby came into this world. What is something that did not go as planned that you are thankful for? Thank you to Rachel, this morning I had a fresh glass of orange juice! 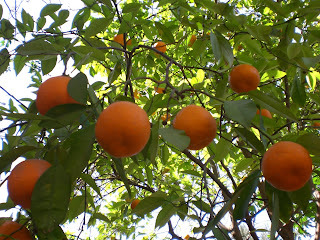 She was nice enough to give me some oranges in which I enjoyed some whole and squeezed some for juice. There is something soo refreshing about the fresh not out of the carton stuff!! I hope to raid her tree again very soon!! Needless to say I have fulfilled my Vitamin C requirements for today! Thank you Rachel for starting my morning off with joy :)! So, tonight at dinner with my family Bailey decided to show off her newest trick: Grabbing dinner plates...yes, whole plates and trying to fling them. I think Tony and I laughed because it was kind of funny... Where did she learn this? Yeah I know, it is the start of "I am going to GRAB whatever I see around me in the distance of my arms". Well she is quick and strong, the plate almost fell. Okay Bailey, now Mommy and Daddy know about this little new trick of yours, we will be ready next time. Bailey thinks she is just soo cute, well we think she is pretty cute also!!
" If ever there is tomorrow when we're not together...there is something you must always remember. you are braver than you believe, stronger than you seem, and smarter than you think. but the most important thing is, even if we're apart...i'll always be with you." Tony and I got the chance to go out this year for Valentine's Day without little Bailey! We choose to go to Suzanne's Cuisine in Ojai! It was a real treat!! We have been there for Valentine's Day now 3 years in a row. This year we had a great dinner out while my Mom and Dad were there to watch Bailey. Thank goodness for such awesome grandparents!! It was so nice to be able to eat dinner without juggling Bailey. Besides having the best food we enjoyed a bottle of wine and had dessert and coffee also! We enjoyed a very good wine, it was a 2003 Mak Coonawarra (Austrailian wine) which is 44% Cabernet Sauvignon, 39% Shiraz, and 17% Cabernet Franc. It was nice, we are going to buy a bottle for our collection! My husband is my best friend. He is always here for me and I can not imagine life without him. I am glad to have spent my 13th Valentine's Day together with him. 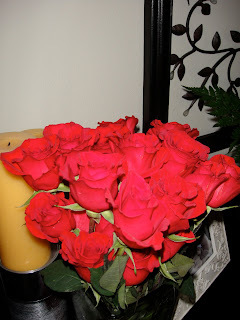 He even got me 24 red roses!! I feel like a lucky girl! Thank you Tony!! 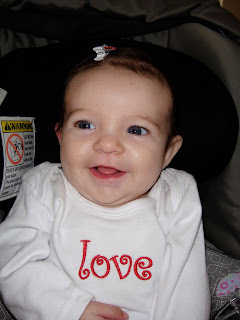 Bailey you are our little Valentine and we LOVE LOVE LOVE you!! 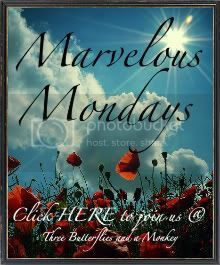 My Friend Rachel has started Marvelous Mondays as a way to take a look at the positive parts of our lives. Rachel is a friend whom has just entered my life, I enjoy her friendship greatly. It is a small world, I bought a couple cloth diapers from her through Craigslist. I am fortunate to have done so. Marvelous Mondays, I think this is an awesome idea and I hope that other bloggers out there will participate with us on Mondays (click and link to her site for better directions or click below this post to join) !! On this Marvelous Monday I am thankful for Friends. I have been thinking a lot about what friends are lately. What defines a friend, is it a person who is always there for you, or someone who is there for you when you are sad, or someone who calls you every week just to say hello, or is a friend someone who only calls once in a while, or the person you never see? I feel like I have a lot of friends in my life, and the conclusion I have come to is that each friend is put into your life for a different reason. Life without friends would be sad. 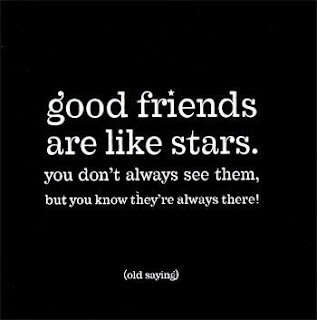 I am happy that I have friends, some of who I have known in my life for a long time, some of whom are new, but still a integral part. To all my very many friends out there, Thank you from the bottom of my heart. I appreciate the little and big things you all do. I hope that all my friends know this. Hope everyone has a day filled with love of friends and family. Love is patient, love is kind. It does not envy, it does not boast, it is not proud. It is not rude, it is not self-seeking, it is not easily angered, it keeps no record of wrongs. Love does not delight in evil but rejoices with the truth. It always protects, always trusts, always hopes, always preserves." Bailey we LOVE you soo very much!! You are what LOVE is all about to us!! 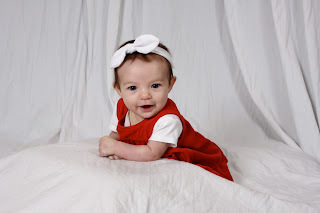 Happy First Valentine's Day to our baby girl!! And to Tony: I love being loved by you, you are my very best friend!! 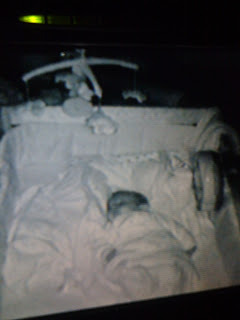 Bailey is sleeping in her own room! Before Bailey was born I thought that I would wait until 6 months to move Bailey to her own "Big girl room". Well, she is in there now at 3 months. Tony and I decided to move her to her own bed because she is to the stage where EVERY new sound is waking her, and she is very interested in watching us and often will not go to sleep without me going to bed. I think Bailey's transition was rather painless. The first night was a little rough and I thought that she was going to regress in her good sleeping habits. Now I can not complain at all because Bailey sleeps awesome (as of now! ), she sleeps 8-10 hours every night, waking only in the morning between 5-6:30 am. The baby websites say she is just about right on par for sleeping hours. The first night we moved her to her crib she woke up every 2 hours all night long. I told Tony that if that continued than she would be back in her little bassinet in our room very soon. The next night and on she went back to her normal sleeping hours in her room! The night that we transitioned her to her room I was a bit nervous. I mean I was not quite ready for this yet (I know I know). I was sad. I love having her sleep in her bassinet next to our bed, if anything every happened she is always close to us...I mean not to be paranoid but bad guys, earthquakes, fires, SIDS, ugghhh. I did not sleep well for the first several nights. Also, I miss listening to her breath, it is the best sound on earth. A lot of people move their babies because they are not sleeping well or because their baby is not sleeping well, but in our case we were all sleeping fine. Some pros of her sleeping in her own room is that now I put her down and I can go and do my stuff for awhile, she sleeps, we do not have to be quiet getting ready in the morning, she is now napping (well when she actually naps) in her crib, and well it is the next step in the process of many. I do not know, in every other country kids sleep in the rooms with their parents and it is okay, and here well we just do not do that. I miss her, I know silly Mommy. Bailey is in love with this toy her Great Grandma and Great Grandpa Woodyard got for her. It is Sophie the Giraffe!! Every time I give it to her she shoves it in her mouth and attacks it!! It is soo cute, plus it saves Mom's hands from being eaten. Bailey is not really fond of baths. I have tried to make the water warm, play with her, bring out toys, the whole thing...she just hates it period. So now we make bath time quick and painless until she decides it is fun this is how it will be. After the bath is done she is a happy baby!!! Then we go to the play area on the floor where the toys are all out, there Bailey and I have play time, and she laughs and rolls around. Bailey makes all sorts of noises and likes to share her opinions of bath time here. I lotion her up and brush her hair, she loves this. She is spoiled and gets a baby massage, I wish I was her!! And a binkie makes it all better... she knows after her bath she will get fed and then usually will take a short nap... that is the routine of bath time for Bailey. Hopefully each time will bring more happy memories. Bailey and I have been enjoying getting together with other Moms and their children. 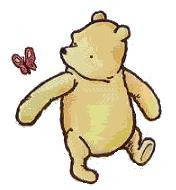 We have joined a few Mom's groups and look forward to much fun to come. There are many fun activities such as play dates, picnics, visits to the farm, and even whale watching!! We met some new friends, Rachel and Kenzington! I am very happy to meet Rachel because she and I have a lot of things we like to do in common. We both love to do CRAFTS!! We have enough project ideas to keep us busy for quite a long while! I will post some of them as we work. We also both have a love of cloth diapering, so we have many conversations about that (yeah I know we are weird but hey we are mommies with great intentions!!) I am lucky to have met Rachel and I am looking forward to many other fun days to come. Her daughter Kenzie is a doll, I love her!! I breastfeed Bailey, so Tony does not get to participate in her many feedings. I enjoy every bit of the process, and would not change it for the world so far. It is the best bonding time for Bailey and I with the added bonus of all the nutrition it is providing to Bailey's growing. I love the time we sit and gaze into each other's eyes. It is an experience I will never forget. Once in a while we do give Bailey a bottle, as I am not fond of her having many bottles (usually only when I am gone-my mom usually gets to give it to her but even this is only once or twice now). 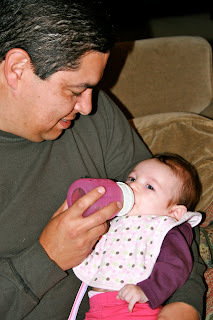 Once Tony got to share a piece of that bonding time... (Bailey will pretty much refuse a bottle from me). Tony did an excellent job!! Bailey is 3 months now! She is changing everyday, I just can not keep up!! She has the most amazing smile and is smiling all the time. Just last week she started smiling way more often. It was like two weeks ago I would have to do silly mommy noises and faces and she would smile, now she has a "gummy" smile all the time and even for people she knows. I think she may even be starting to recognize people (other than Mommy and Daddy), she smiles everytime she sees her Grandma! Bailey is now rolling from her stomach to her back, from her back to her side, she babbles constantly, she is grabbing at objects, and she even knows how to play baby piano on the iPhone!! Tony and I notice that she is adding new sounds to her vocabulary daily and she actually is trying to imitate us often. Bailey's favorite things right now are nursing of course, laying on her baby einstein mat, looking at the TV, time on her changing table, Daddy's ducky talk, laying on her back when we are talking to her, being walked around, standing up (not on her own of course! ), she loves to sleep, and giving kisses (yes it is the most cute and best thing in the world!!). Bailey does not like tummy time that her Mommy makes her do daily, she is not fond of naps at all although we are squeezing one in per day, and she does not like being bored!! 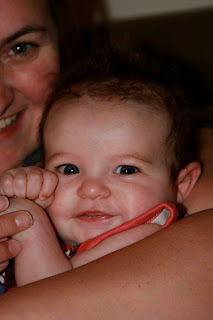 New things we have been up to: We joined a couple Mommy Groups, so that has been a fun experience. 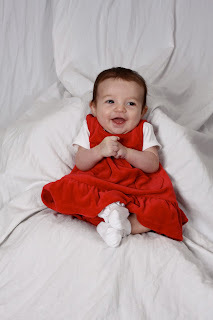 We have also been getting together with a couple of my friends that have little ones, Bailey loves to watch other children, she is just all smiles (I think she secretly wishes she could walk already, no baby do not grow up too fast!). Bailey is an amazing little girl and the light of Tony's and my life. She makes our days shine. I am very fortunate to be home with her right now, I can not imagine missing out on her right now. It is the best thing watching Tony and her interact now, she loves her Daddy. 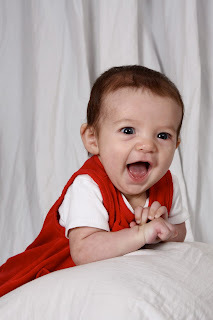 Tony is excellent with her, he is very animated and EVERYTHING they do together is filled with sounds and playtime. It is incredible to watch them play, Bailey you have a great Daddy! As for me, I am in love with my little girl. She makes me smile, laugh, cry, and I do not mind giving my all to her EVERY DAY. My life has changed since I have had her, no doubt, it is much different, but honestly I would not change anything, not a thing. Thank you Bailey for making your Mommy so happy everyday. I love you little girl and always will. You are amazing, never forget that my baby.